washing up yesterday, I turned a cup in my hand examining it for particles of matter. Accompanying this act was a thought of people in great magnitude doing just this, a wave of cup turning day after day, year after year- hygiene, vision and stubborn marks. The extension of the singular into the multiple, I do it all the time, dissolving the continuity of my own experience of time into the episodic fragments of others. Most of the time this mental activity leads to an unwelcome moment of helplessness, or perhaps it’s the need of help, a lack of some kind that brings it on. I can remember when it first came to me as an adolescent in the English Midlands, one who walked a lot along city streets, railway lines and pathways. counting road reflector spikes and considering each one planted by someone employed to do just this. the repetitive elements of the urban environment were feeding back into something within me which also seemed constituted by series . this was at a time when I was trying earnestly to figure out what future work I was going to be able to fit into, road and rail crews, distribution and collection, unanswered callings. As one of his first scientific projects, the young Descartes began an exuberant treatise on the wonder of nature. The church deemed this earthly focus heretical and threatened him with excommunication. He then performed a cunning sidestep with a new angle that legalised his research, viewing the world as a doubtful space prey to the observer’s subjectivity. 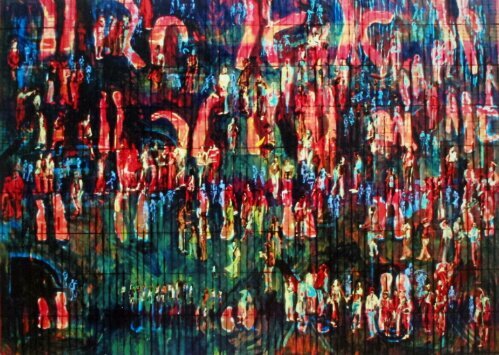 My painting goes through some excruciatingly convoluted processes to arrive at a completion. In my teaching classes I show images in-process of a painting I completed a few years ago as an example of decisive changes in direction that can take place in trying to maintain a focus on the subject. 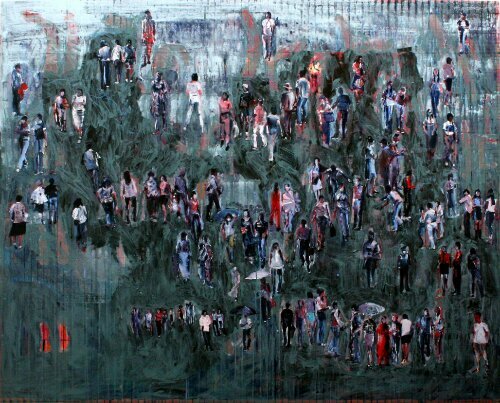 Initially in this painting several systems of grid, figures and chromosome pairs were superimposed as a kind of problem in the depiction of an urban crowd. In the second documented stage they are severely constrained to develop a tonal point of view; the final application produces a singular field, a space that is a kind of model like those sociobiologists tell us we construct to conceptually attend to our worlds. 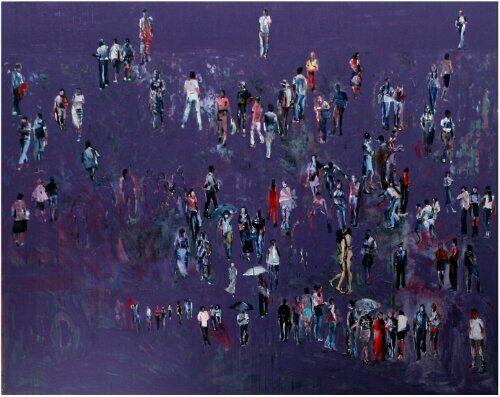 This entry was posted in art, crowd formation, drawing process, information processes, public space, screenplay, urban space and tagged Descartes, painting, sociobiology, urban crowds. Bookmark the permalink.